It turns out the DNA is real, check out our full review of the HTC Droid DNA smart phone. Phone fans could be in for a treat next week, as HTC and Verizon have sent out invitations to a press event to be held in New York on November 13, where we could get the first 1080p smartphone/tablet hybrid launched outside Japan. The invite doesn’t appear to contain any hidden messages, showing nothing more than a lens-flared light on a dark background, but a few leaked press pictures could give us a better idea what these long-time partners are preparing for us. 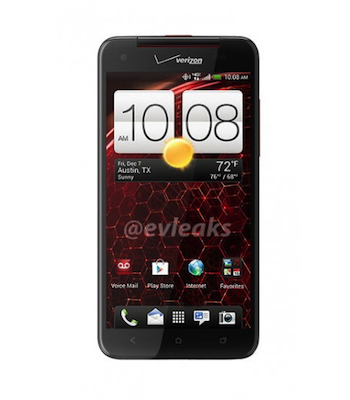 The images popped up on @evleaks’ Twitter account this week, and show a big-screen, Verizon-branded HTC smartphone that bears a striking resemblance to the HTC J Butterfly. Quite how such a bizarrely named phone could slip you memory, we’re not sure; but just in case it has, here’s what it’s all about. Announced last month in Japan, the J Butterfly has a 5-inch display with a headline-grabbing 1080p resolution. It seemed inevitable that HTC would let the Butterfly spread its wings at some point, and the Verizon event seems like the ideal launchpad. Five-inch, full HD touchscreens are set to be the next big thing in the world of the smartphone display, with Sharp’s 1080p IGZO screen making its debut this week, and LG confirming recently that it’s also working on a similar panel. It’s highly unlikely the J Butterfly name will remain on the US version though, and instead it’s likely to be another “Droid” device, this time the Droid DNA. That name has appeared on both the FCC’s website and a leaked Verizon price list, and has superseded other possible names including the HTC DLX and the HTC X5. Neither of those names are dead though, and could be used for a GSM version of the phone. If the 5-inch, 1080p screen isn’t enough to get your pulse racing, then should the Droid DNA share the J Butterfly’s other features, it will also have Qualcomm’s high performance, 1.5GHz, quad-core Snapdragon S4 Pro processor, plus Android 4.1 Jelly Bean as its operating system. Previous leaks have suggested a December 6 release date for the phone, but we’ll have to wait for the November 13 event to confirm this, and all the other details concerning HTC and Verizon’s new device.